In Kanchanaburi, there is a beautiful elephant sanctuary, called ElephantsWorld. Its idea is that you’ll be working for the elephant rather than they’ll be working for you. 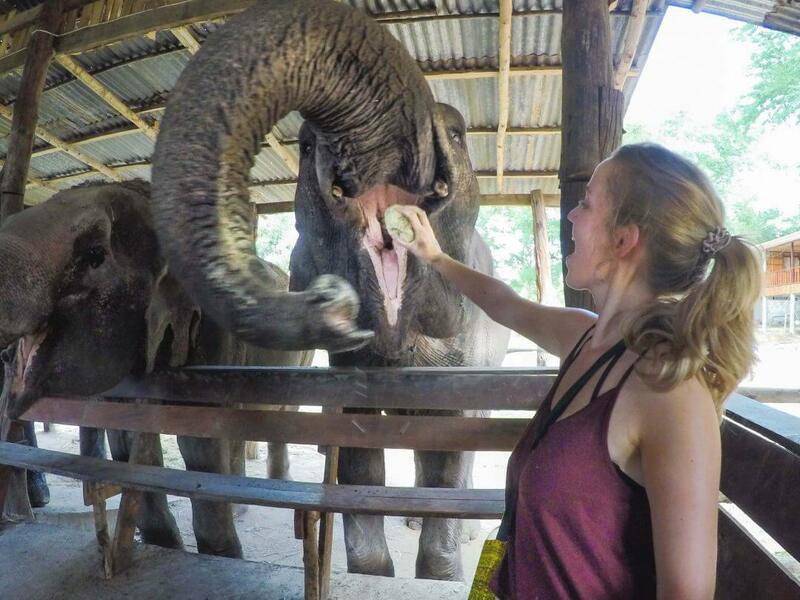 You can take care of the elephants in Thailand for one or multiple days. The elephants in the sanctuary are all either sick, old, disabled, abused or rescued. The sanctuary is there to make the rest of the elephant’s life a better life. After visiting we were sure that the people who work at this Elephants Sanctuary in Thailand do their best to take perfect care of the elephants. Small sidenote to the picture: The people on their necks are Mahouts of elephants. Elephants are often ‘orphan’ and sadly enough they can’t function without their mahout. Please note: This article is written in 2016. We don’t know about the exact situation but our personal experiences back then were good. We did a one day tour from Kanchanaburi. Once the driver drops you off at the sanctuary, the tour begins. Tip: Don’t forget to take bananas with you! The elephants love them! The caretakers in the sanctuary will tell you more about the elephants, why they are here and what they do to take care of them. You will start off by feeding the elephants fruits and vegetables. They will grab this out of your hand if you aren’t fast enough. You can take the older elephants for a walk to the other side of the sanctuary. There, you will prepare food by cutting vegetables and cooking sticky rice for the elephants who don’t have enough teeth anymore. The caretakers will put medicine in the food as a way to medicate those elephants that need it. The elephants will join you while you’re cooking and can’t wait to eat the meal you prepared for them. Getting to ElephantsWorld needs some planning. Fly to Bangkok and book your stay in Kanchanaburi or at the sanctuary. ElephantsWorld will take care of your lunch. And as you probably know, the Thai dishes are sooo yummy. After replenishing your energy, you will get back and watch how the elephants take a mud bath. This is especially cute when those little ones start jumping around in the mud. Elephants do eat a lot, so the sanctuary grows its own bamboo. Our job was to cut the bamboo and take this to the young elephants. Last but not least, you’ll get the chance to clean the elephants after their mud bath. Join them in the river and climb on their neck. This is such an amazing experience because you come close to such an impressive animal. Review: The elephants genuinely seem to have fun. They’re playing with each other and the supervisors were there for supervising only. We don’t support sitting on the elephant nor its neck. We do think they do the best they can at this elephants sactuary. You also can volunteer in ElephantsWorld and help this company to support the elephants in Thailand. At our time of visiting, there were a lot of volunteers so you’re probably going to make some new friends too. 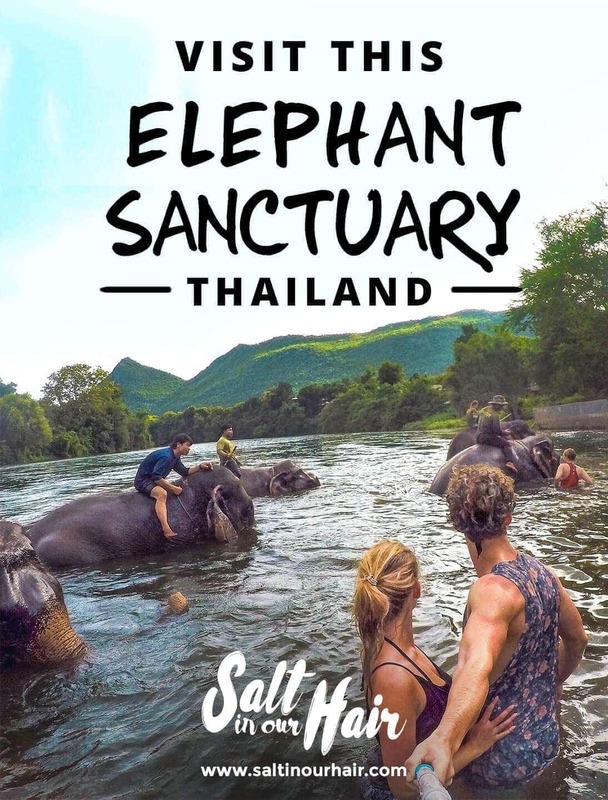 The elephant sanctuary is near Bangkok but still, it’s better to stay in Kanchanaburi. Take the train from Thonburi, Bangkok and make sure to get out in Kanchanaburi. If you miss the last stop in Kanchanaburi you’ll be on the train for three more hours. Like we did… ? It’s best to stay in Kanchanaburi or in ElephantsWorld itself. We also got you a $15 discount at Booking.com if you book via this link. Close to the bus station and clean rooms with free WiFi. Popular, cheap place to stay with free WiFi.